Gothtober Day 2 – The Terror Tunnel, by Rick Orner! Uncategorized Comments Off on Gothtober Day 2 – The Terror Tunnel, by Rick Orner! Are you up for a haunted attraction involving paranormal activity and partying with the undead? Rick Orner brings to us a P.O.V. simulation of what such a thing might entail. Your car glides on its rails, lurching right, pitching left, each new direction revealing a new spooky tableau! Do you remember going to the county fair and staring at the terrifying facade of the Haunted House ride? Do you remember it looming over your small frame, it’s metallic edges painted over to resemble decrepit castle stones or rotting wood? At age 7 or 8, this was enough to make you want to flail wildly, scream bloody murder, and run in any direction BUT one of these places. But at some point, you’d brave your better sense, get in one of these things and survive, but perhaps not without throwing all your popcorn in the air from being scared so badly. 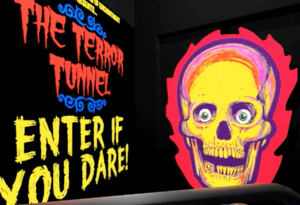 Get that feeling back again as you enter the terror tunnel, maybe have a little cotton candy, or some roasted peanuts. Dark rides were invented in the late 19th century, often called “pleasure” or “scenic” railways. 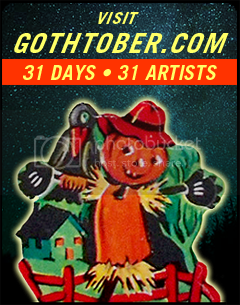 This is the first one ever designed with Gothtober in mind, we’re thrilled that Rick Orner kept us in the dark, so to speak! please keep all hands and arms inside the vehicle at all times. We don’t want you losing a limb… or do we? Read Rick Orner’s and other Gothtober contributor’s bios here!